You can scan the Billboard 100 from top to bottom and you won’t find a listing for the day’s chart-busting rain, ocean, and babbling brook sounds. But that doesn’t mean there aren’t listeners intensely interested in filling their ears with exactly that kind of audio. Whether to help lull you to sleep or block out the sounds of a tightly packed open office, ambient audio can be a useful tool. And, best of all, it needn’t be confined to the tiny-speakered/tinny-sound consumer “sleep machines” you find advertised in the back of in-flight magazines. With an iOS device you can be wrapped in an otherworldly environment in seconds. While not as common as to-do list managers and Flappy Bird clones, the App Store has its fair share of ambient audio apps. These are a few of my favorites. Naturespace has some wonderfully natural sounding nature tracks. Naturespace (free with in-app purchases): Holographic Audio Theater’s Naturespace is a player for the company’s ambient nature sounds in addition to a storefront for sounds you can purchase for $2 each (or in bundles priced at $10). 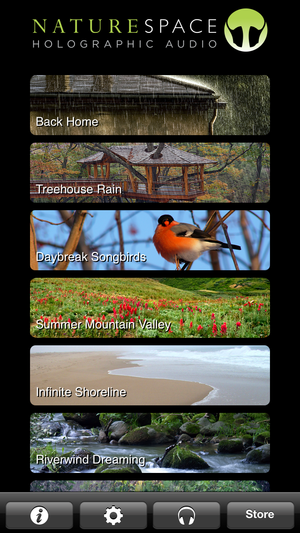 The app comes with six tracks—Daybreak Songbirds, Summer Mountain Valley, Infinite Shoreline, Riverwind Dreaming, Rain Into Water, and Night at Lake Unknown. They’re perfectly fine for masking out other sounds during the daytime, but I’d find them too intrusive to sleep to. If sleep is what you’re after, you’ll want to turn to the store. Here I found a couple of terrific rain sounds—Back Home and Treehouse Rain. Back Home is set in a suburban environment where you can hear rain on pavement as well as running through metal gutters (accompanied by a very distant thunder). The quality of the recording is outstanding. 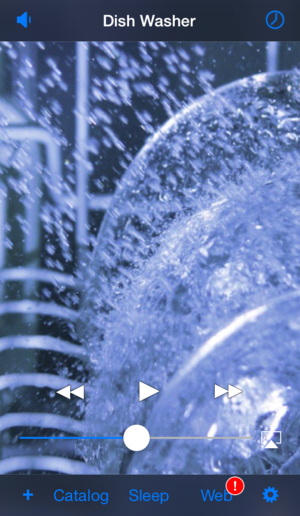 Rather than feeling like you’re falling asleep to a white noise generator you can hear individual drops and torrents. Treehouse Rain is equally good if you prefer a more natural sounding rain mixed with a touch of wind-swept branches. White Noise has an eclectic collection of ambient sounds. White Noise ($2): Tmsoft’s White Noise is more than just a white noise generator. Sure, it has its collection of colored noises—white, brown, pink, blue, and violet—but it also includes not only the kind of nature sounds you’d expect (rain, crickets, ocean waves, and wind) but also some unexpected offerings—camp fire, cat purring, air conditioner, clothes dryer, dish washer, heartbeat, crowded room, and train ride. These may seem like bizarre additions to some, but—at the risk of over-sharing—as a kid I loved the sound of a running dishwasher. One of White Noise’s highlights is that you can mix up to five sounds together. So, switch on Heavy Rain Pouring, Thunder Storm, Blowing Wind, Oscillating Fan, and Boat Swaying in Water and then adjust each sound’s level to create your preferred audio environment. The app also includes a free White Noise Market where you can download additional sounds at no cost. Sleep ($2): Red Hammer Software’s Sleep offers over 100 sounds (some include ambient music) that can be triggered individually or in groups from your iOS device. Like White Noise you can combine multiple sounds—ocean waves with rain and, perhaps, a bit of waterfall to complete the aqua-themed mix. (Unlike White Noise you can mix far more than five sounds). Just tap the Mixer button, select the sounds you want to play, and then—after tapping on the Settings button—adjust the volume of each sound. You can then save your mixes for later playback. Sleep also has a store for obtaining additional sounds (some free, some you pay for) and it includes timer and alarm features. If I have one complaint about it, it’s that some of the sound loops are so short so that you start to recognize patterns. And when you do, focusing on the repetition may keep you awake rather than relax you. 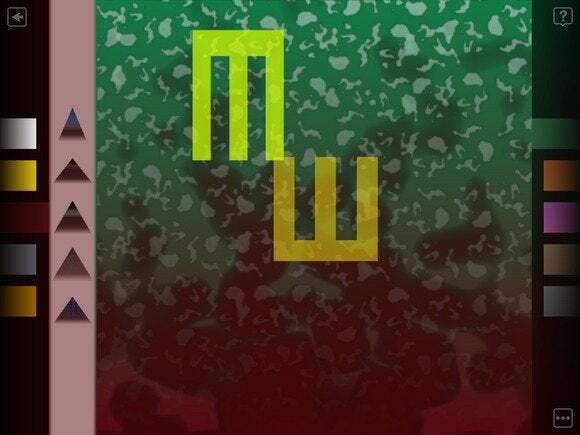 Mix and match relaxing sounds and music with Sleep. The Eno apps: Musician/Producer/Artist Brian Eno is considered by many the father of ambient music with such releases as Discreet Music, Music for Airports, and Thursday Afternoon. Eno and musician/software designer Peter Chilvers have created a trio of ambient music apps—Bloom ($4), Trope ($4), and Scape ($6). All three allow you some control over what the resulting music sounds like. In the case of Bloom, you do this by tapping on the screen. With Trope you drag on the screen. And in Scape you drag elements into the screen that modify the character of the music. Bloom and Trope each have sleep timers but unless these timers are engaged the apps will continue to play until you stop them. Scape’s preset music plays for many minutes but soundscapes you create will play continuously. I’m a fan of Eno’s work and so enjoy the music generated by the apps, but some people may find it a little eery. My guess is that Eno and Chilvers designed these apps with interaction in mind. And they are a joy to play with. But if you’d prefer using them as set-it-and-forget-it music generators, no one would fault you. Eno and Chilvers' Scape will generate evolving ambient soundscapes for you. As you may have noticed, the iPhone, iPod touch, and iPad are fairly slim slabs of technology. This means they hold small speakers (which, in the case of the iPad, can sound pretty good). 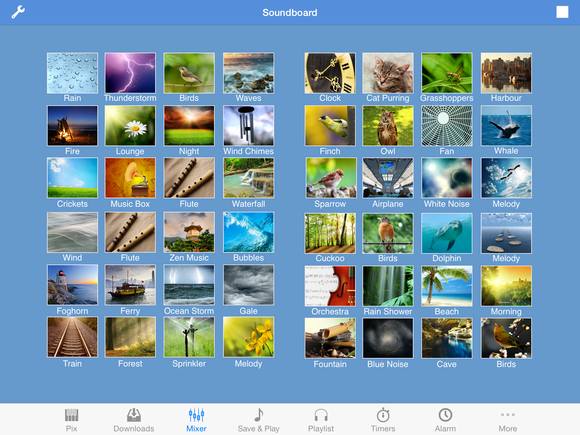 An app like Naturespace greatly benefits from headphone or better speakers as you can then discern the realism of its sounds. Headphones are obviously the answer if you use apps like these to shut out your coworkers or a coffeeshop’s clatter, but not so great when you’re trying to sleep. Your ears—like you—benefit from fresh air (and honestly, ouch!). Speakers can come in the form of powered units attached directly to the device via an audio cable or dock or wirelessly to Bluetooth speakers or AirPlay devices (an Apple TV or AirPort Express connected to powered speakers, AirPlay-compatible speakers, or, in a pinch, your Mac). A fully-charged iPhone, iPod touch, or iPad should deliver sound through a solid 8-hour snooze but if you don’t care to start your day with a mostly-drained battery, plan to jack your device into a charger before you bed down for the night. Ambient audio isn't for everyone as it can be a little distracting to be surrounded by a howling rain storm while gazing out the window at a desert landscape. On the other hand, when visiting the dentist would you prefer the all-too-real whine of a whirring drill or the entirely artificial sound of a remote beach? Reality has its place, but this is the stuff dreams are made of.